Josh Morrissey and Dustin Byfuglien scored 1:10 apart in the second period as the Winnipeg Jets defeated the Toronto Maple Leafs 3-1 on Saturday night. 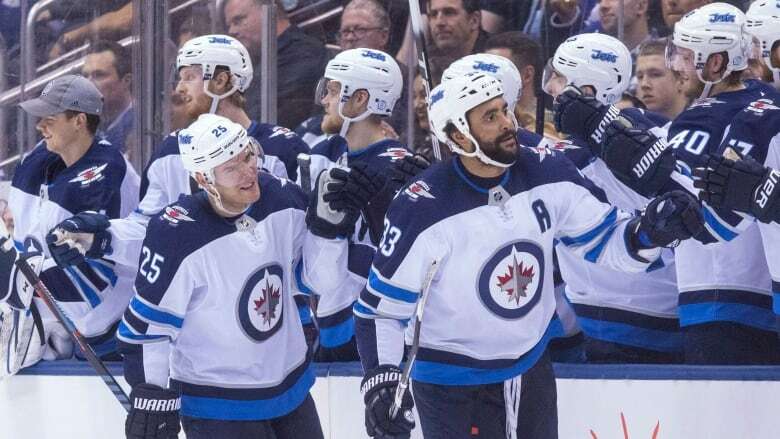 The Winnipeg Jets weren't worried about performing in front of a national television audience on a Saturday night against the only other Canadian team heading to the playoffs. An embarrassing home loss to open the season nearly six months ago coupled with a poor effort last time out provided more than enough fuel. Josh Morrissey and Dustin Byfuglien scored 1:10 apart in the second period, Connor Hellebuyck was solid in making 28 saves, and Winnipeg defeated the Toronto Maple Leafs 3-1. Andrew Copp had the other goal for the Jets (48-20-10), who had their doors blown off by the Leafs 7-2 back on Oct. 4, and were coming off Thursday's disappointing 6-2 setback in Chicago that snapped a six-game winning streak. Talk of Winnipeg or Toronto assuming the unofficial moniker of "Canada's Team" when the post-season begins in less than two weeks can wait for another day. "We kind of owed them one," Morrissey said. "We didn't like the way the last meeting went at the start of the year ... and with the way we played in Chicago the other night we really wanted to rebound. "We had a lot of motivating factors." Patrick Marleau replied for the Leafs (47-25-7), who got 26 stops from Curtis McElhinney. Toronto was playing its third game in four nights, including the second of a back-to-back following Friday's 5-4 victory in New York over the Islanders. "I'm disappointed," Leafs head coach Mike Babcock said. "When you don't have quite as much juice, you're not quite as good. "It was tight. In the end, they were better." Winnipeg was eager to get back to playing a physical, defensively sound game after Thursday's showing. "We were on the puck much better," Jets captain Blake Wheeler said. "That's a [Toronto] group that wants time, wants space, wants to be creative." The Leafs are all but assured of finishing third in the Atlantic Division, while the Jets look just as certain to wind up second in the Central. But both teams are hoping to use these final few outings as playoff tune-ups. "It just shows you've got to be sharp each and every night, and sometimes the details of the game is the difference — most of the time it's the difference," Marleau said. "Tonight was no different." Toronto's only blemish at home in more than two months coming into Saturday was Monday's 3-2 defeat to last-place Buffalo, a loss that ended a club-record 13-game winning streak at Air Canada Centre. The Leafs rebounded with a 4-2 victory at home against Florida on Wednesday before Friday's victory. Toronto grabbed a 1-0 lead just 2:02 of the second when the league's third-ranked power play went to work. Auston Matthews looked primed to shoot on Hellebuyck from the left face-off circle, but instead fed Marleau, who redirected home his 26th of the season from the top of the crease. Morrissey tied it at 8:30 when his blast from the point past a screen caught McElhinney moving the wrong way for the defenceman's sixth. The Toronto netminder was then run into by Winnipeg's Mark Scheifele after he stopped a Wheeler breakaway seconds later, but no penalty was called on the play. Playing minus rookie defenceman Travis Dermott because of a lower-body injury suffered in the first, the Leafs found themselves short-handed soon after when Jake Gardiner cross-checked Scheifele. The Jets' power play — which sat fourth overall heading into Saturday — went to work, and Byfuglien snapped his seventh in off the post at 9:40. Winnipeg pulled ahead 3-1 seemingly out of nothing on a broken play with 2:26 left in the period when Copp fired his sixth shortside. "It's tough when you give up a power-play goal," Morrissey said. "That's some of the growth in our team — we got right back on our horse and really went after it. "That's something we're going to have to do definitely going forward here and into the playoffs." Leafs or Jets? Which has better shot of ending Canada's Cup drought?